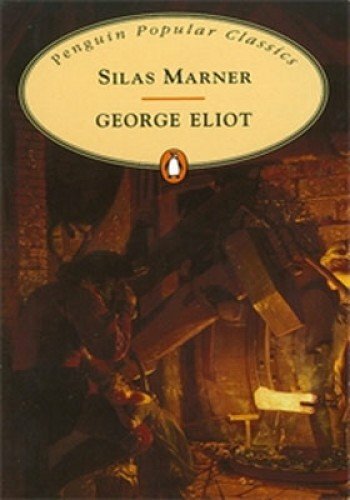 The back cover of my Penguin Popular Classics edition of Silas Marner tells me it was George Eliot’s own favourite novel. The story revolves around Silas Marner, a weaver living in Raveloe, a village on the brink of industrialisation. He was wrongly accused of theft and left his home town to live a lonely and embittered life in Raveloe where he became a miser, hoarding his gold and counting it each night. Until one night his life is changed by the theft of his money and a little girl who came to live with him, having been abandoned in the snow. … pallid undersized men, who by the side of brawny country-folk, looked like the remnants of a disinherited race. The shepherd’s dog barked fiercely when one of these alien-looking men appeared on the upland, dark against the early winter sunset; for what dog likes a figure bent under a heavy bag? – and these pale men rarely stirred abroad without that mysterious burden. There are two strands to the storyline – one about Silas and the other about Godfrey Cass, two very different men, one poor, a social outcast and the other rich, the son of the local squire. They move in very different social circles, the Cass family life is one of lazy indulgence, but their lives intersect through the arrival of the little girl. I wondered whether this would be a sentimental tale, but although it is touching it isn’t sentimental. In the end it’s about a world of uncertainties, of ways of looking at life, of the nature of belief and religion and of the possibilities of change. And it does have a happy ending. As well as being my Classics Club Spin book it’s also one of my TBRs, qualifying for the Mount TBR Reading challenge. I found your review appealing too, the quotes pulled me in, so I might give this a go at some stage. I just bought this book at a used book store going out of business. I have a lot of trouble reading long, long sentences so I hope I can manage it. Thanks for this lovely review. You’re right, it is touching without being sentimental, which is maybe why I like it so much. I consider it a perfect little gem of a book. Glad you enjoyed it.